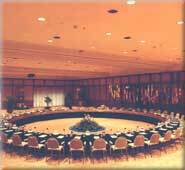 The Bali International Convention Centre is situated right on Nusa Dua Beach, 30 kilometres from Denpasar and 10 kilometres from the Ngurah Rai International airport. The Centre is within walking distance of luxury hotels, fantastic shopping, entertainment, restaurants, a champion- ship golf course and a host of other recreational facilities. BICC's main hall seat 2500 theatre, or 1200 for banquet with 2394 meter, 2 balconies, built in stage of 17 x 3 meter additional portable staging available, built in large form screen of 5 x 8 meter as well as built in PA and speaker for max 200 watt. Highest ceiling 10.5 meter. Tiered seating 506, built in stage 12.6 x 6.3 meter, built in screen 4.7 x 10 meter sound system for speaker up to 300 watt, highest ceiling - 7.2 meter. 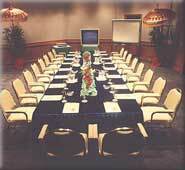 Eight additional function rooms, four of which divide, provide meeting space totalling 3,490 square metres. 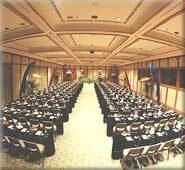 Meeting Room Available for 10 - 500 pax. Business centre with multi-lingual staff provide complete secretarial services, including word processing, photocopying, facsimile and internet access. A press room, large conference registration counter, organizer's office and two separate secretariats offices are also available. Attendee registration, audio visual technicians, electrician, plumber, sign painter, messenger, carpenter, security guards, decorating, first aid, portable PA system, microphones and stands, screens, closed circuit TV recorders, loudspeakers, portable stages, lecterns, podiums, padded metal stack chairs, black/white boards, flannel boards, writing materials, lobby bulletin board, directional signs, AV. replacement parts. Typesetters, name cards/holders, truck/van, locksmith, print shop, photographer, musicians, tours, entertainment, medical, bank, shopping arcade, tour desk, flower shop, security, and photographer. Experience a night of the culture of The Island Of The Gods. Follow traditional drums and bells of the Tektekan, and Balinese villagers dancing along a torch-lit pathway to Nusa Dua Peninsula, where charming Balinese costumed hostesses welcome you to the Mengwi Temple. The stage is a blaze of colour as performers enact classical Balinese dances. Exotic spices fill the air; traditional Indonesian and Balinese delicacies served in traditional containers from vendor stalls like those found on virtually every Indonesian street corner. A colorful crafts market, where you can bargain for souvenirs, and market styled vegetable stand where you can learn about authentic Indonesian cooking.